One of the most durable guards in the league for nearly a decade, Andy Levitre tore his triceps in the Falcons’ second game of the season in 2018 and landed on IR. That immediately led to speculation that Levitre could consider retiring this year, especially since his contract with Atlanta is up. However, Vaughn McClure of ESPN.com tweets that Levitre, who turns 33 in May, is not ready to call it quits and wants to continue playing, though it sounds as if his triceps injury is not completely healed. It also sounds as though Levitre will not be back with the Falcons, as the club agreed to terms with two free agent guards this afternoon. He agreed to a pay cut with Atlanta last season in order to remain with the team, and the fact that a triceps injury also ended his 2017 campaign prematurely will surely give other teams pause. But despite the early end to the 2017 season, Levitre graded out as one of the 20 best players at his position in the NFL that year, per Pro Football Focus’ advanced metrics, so he surely has something left in the tank. If he hasn’t changed his mind in a couple of months, and if he can get healthy, he will attract some interest on the open market. Andy Levitre is staying put in Atlanta. 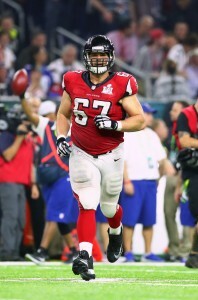 The Falcons have agreed to a restructured contract with the standout guard, a person familiar with the negotiations tells D. Orlando Ledbetter of the Atlanta Journal-Constitution. Levitre was set to enter the year with an $8.375MM cap number. He’s accepted a base salary reduction from $7MM to a fully guaranteed $3.5MM, while his salary cap charge will drop from $8.375MM to $5.875MM, according to Field Yates of ESPN.com (Twitter link). Levitre, 32 in May, has been one of the league’s better guards since entering the league in 2009. In 2017, he graded out as one of the 20 best players at his position in the NFL, per Pro Football Focus’ advanced metrics. He started every game since joining the Falcons in 2015 until he suffered a torn triceps late last year. He returned in Week 17, but he landed on IR after re-aggravating the injury. Had he been released, Levitre would have profiled as one of the very best interior lineman on this year’s open market. For a look at those who are available, check out PFR’s rankings of the top offensive free agents by position. Guard Andy Levitre will be back and ready to go next season, according to Falcons GM Thomas Dimitroff (Twitter link via ESPN.com’s Vaughn McClure). Levitre missed time at the end of the 2017 regular season and was unable to suit up for their playoff games against the Rams and Eagles. Levitre, 32 in May, is under contract with the team for one more season. He is slated to carry an $8.375MM cap hit and it’s conceivable that the Falcons will seek a cap smoothing extension with him in the coming weeks. As of this writing, the Falcons have roughly $11.5MM in cap room to work with and they’re hoping to extend quarterback Matt Ryan while addressing other needs. Levitre had never missed a regular season game in his NFL career until he suffered a partially torn triceps in Week 13. He attempted to play through the pain in a late season contest against the Panthers, but he was forced out after only five plays. Last year, Levitre graded out as the 17th best guard in the NFL, per Pro Football Focus’ advanced metrics. The Falcons will head into the playoffs without the services of a starting offensive lineman. Left guard Andy Levitre has been placed on injured reserve, according to a team announcement. Levitre missed the bulk of December with a partially torn triceps. He attempted to return to action on Sunday against the Panthers, but he lasted only five plays. Ben Garland took over for Levitre in the winning effort against Atlanta and he’ll be the starter for the Falcons on Saturday when they face the Rams. Levitre, 31, has been one of the NFL’s better guards since entering the league in 2009. This year, he graded out as one of the 20 best guards in the league, per Pro Football Focus’ advanced metrics. To take Levitre’s spot on the 53-man roster, the team has promoted running back Terrence Magee from the practice squad. Falcons guard Andy Levitre left the Falcons game vs. the Vikings on Sunday and wasn’t able to return due to a partially torn triceps. Now with a quick turnaround for the team’s Thursday night affair against the Saints, Levitre will not be able to suit up in Atlanta’s Week 14 contest, according to Ian Rapoport of NFL.com (Twitter link). However, Rapoport does clarify that a source tells him the injury is not a season ender. The team is hopeful that the lineman could return after just “2-3 weeks”. Levitre, 31, has been one of the better guards in the league since he entered the NFL as a second round pick by the Bills in 2009. Even as he gets older, Levitre still ranks as a top 20 guard in football this year, according to Pro Football Focus. He grades out similarly in terms of run and pass blocking, so there’s not one area he shows great weakness or strength in so far in 2017. Backup lineman Ben Garland came into replace Levitre in yesterday’s game, so you can expect him to get the first crack as the starting left guard on Thursday. The team also has Ty Sambrailo, Austin Pasztor and Sean Harlow on the bench for depth purposes. A pair of NFC South offensive linemen have restructured their contracts with their new teams, according to Field Yates of ESPN.com, who reports that Falcons guard Andy Levitre and Saints center Max Unger have both reworked their deals. Levitre, acquired last week by the Falcons, had originally been due $27.3MM over the next four seasons, but Atlanta reduced that figure to $23.25MM and sliced his 2015 salary from $6.5MM to $1.5MM (Twitter links via Yates). In return, the former Titans guard received a $5.5MM signing bonus, which will drop his cap hit for this season from $6.5MM to $2.875MM. As Vaughn McClure of ESPN.com details (via Twitter), Levitre’s base salaries for 2016 and 2017 have been reduced as well. Meanwhile, the division-rival Saints completed a simple restructure on their new center’s contract, converting $3MM of Unger’s base salary into a signing bonus (Twitter link via Yates). Since the ex-Seahawk has just two years left on his deal, that bonus will prorate equally in 2015 and 2016, giving New Orleans an extra $1.5MM in cap room this year. Neither restructure is expected to open the door for the Saints or Falcons to add a notable player — they’re simply designed to create some additional flexibility if and when the teams need to put players on injured reserve and bring in injury replacements throughout the season. 12:03pm: The Titans have officially confirmed the trade, per Jim Wyatt of Titans Online, who tweets that Tennessee will get a 2016 sixth-round pick and a conditional pick in a future year from the Falcons. 11:31am: The Falcons are acquiring a veteran guard in a trade with the Titans, according to Mike Florio of Pro Football Talk, who reports (via Twitter) that Andy Levitre is heading to Atlanta. Levitre himself first hinted at the move, tweeting out the message “#RiseUp” from his official account. Levitre, 29, has started all 16 games for the Titans at left guard in each of the past two seasons, and has never missed a game in his six-year NFL career. However, while his consistency and ability to stay on the field is an asset, Pro Football Focus (subscription required) ranked the veteran lineman as just the 45th-best guard out of 78 qualified players last season, giving him a -5.8 grade. There had been plenty of speculation that Levitre would be released by the Titans before the season, since his cap charge for 2015, and for each of the following two seasons, is an exorbitant $8.6MM. By trading Levitre, the Titans will still be on the hook for $2.1MM in dead money this year and $4.2MM next year, but it would reduce his cap hit significantly. As for the Falcons, they’d take on Levitre’s $6.5MM salary, which seems like an awfully steep price to pay for a guard who’s not among the league’s best. Atlanta released another veteran guard, Justin Blalock, earlier this offseason, and Blalock didn’t carry as large a cap number as Levitre does. Still, we don’t have the full details on the move yet, so it’s possible there are other factors in play here — Levitre may have accepted a pay cut as part of the deal, or the Titans may be paying a portion of his 2015 salary, for instance.